One of the cheapest, easiest ways to get iOS in your car. But is it any good? In some ways a joy to use, in others very frustrating. Requirement for an internet connection is a major problem. With Apple's CarPlay in-car tech recently in the news, you may be wondering what good it all is if you don't happen to be buying a new car in the next couple of years. Put another way, is there any way you can get iOS into your existing car? 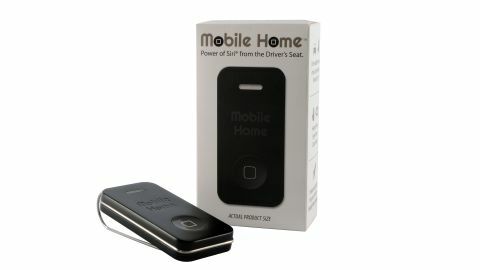 Up to a point, yes, and part of the answer for you could be the Mobile Home in-car Siri enabling gadget. Of course, there are many ways you can get some in-car iOS goodness. Simple things like a dock for for iPhone. If you want to go a bit Heath Robinson, you can DIY an iPad into your dash. It's been done. But for most of us, what we want is something cheap, simple to set up and easy to use that gives at least some access to iOS in the car. And that's exactly what the $80/£50 Mobile Home does. It's essentially a Bluetooth-based patch through that links your car and Apple's Siri voice control system. On paper, it means you can have access to all your iPhone's Siri-based functionality in the car and on the move. That means stuff like sending and listening to texts, emails and social network updates, controlling music playback, making phone calls, setting up calendar events, inputting navigation queries and destinations and more. Intriguing, eh? The one proviso is that you'll need a car that already has integrated Bluetooth connectivity with hands free. Not too onerous a requirement, but worth noting. The Mobile Home proposition is pretty simple. It's a small device with a single button that essentially duplicates the functionality of holding the home button down on an iPhone to wake Siri up. Via the magic of Bluetooth, you can then talk to your iPhone via your car's hands-free microphone and audio system, giving you access to the full gambit of Siri voice control. Of course, the Mobile Home has no screen of any sort, so if you want to do something that requires visual interaction with iOS, you'll need to have your iPhone docked or cradled somewhere on the dash. The Mobile Home is purely about voice-based interaction with Siri. It's also worth noting that the Mobile Home is not going to give you voice control of your car's broader multimedia kit. Its just about controlling your iPhone. For power, the Mobile Home uses a single CR2550 disc/coin-shaped non-rechargeable lithium battery. You get two batteries with the unit, each claimed to be good for about six months. Setting the Mobile Home is pretty straight forward. First you sync your iPhone with your car. Then your sync the Mobile Phone with your iPhone. And that's it. From then on, you simply leave the Mobile clipped to your sun visor or similar. It automatically goes to sleep after extended periods without use. To wake it up, you just press the button when you jump onboard. We sampled the Mobile Home courtesy of the new Vauxhall Adam White Edition, a car that happens to have quite a bit of iOS support of its own. Anyway, in our testing, there wasn't any detectable drop-off in voice recognition performance. In other words, Siri via the Adam's microphone and on the move was just as accurate or not as using Siri out of the car and via the iPhone handset. We assume your mileage may vary according to the quality of your car's Bluetooth installation. But without testing a given car, it's hard to get specific about likely performance. What was less impressive was general responsiveness and reliability of operation. We often had to have a couple of stabs at pressing the button to wake Siri up, which does a pretty good job of dispelling the sense of ease of use. Arguably worse was a glitch with Siri's voice output via the Adam's audio system, which was sometimes clipped. In other words, you lost some of what Siri was saying. How much of that is down to the car or the Mobile Home device is hard to say, but it does make it hard to give the device a really strong immediate recommendation. In an ideal world, you'd try it with your car before you buy. Finally, it's worth noting that Siri requires an internet connection to function and that can be a problem for cars moving in and out of range.